Aneesha is the creator of Osho Pulsation, a meeting of neo-Reichian breath and bodywork with meditation. She has also developed Tantric Pulsation, which is rooted in the body’s natural capacity for pleasure and joy, and the spirit’s longing for expansion and stillness. 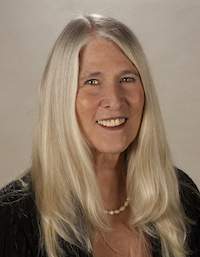 She originally trained in neo-Reichian education with Charles Kelley at the Radix Institute over 30 years ago, and in 1976 went to India to meet the Indian mystic Osho. Through her long association with Osho's work she has developed a unique synthesis of Eastern and Western techniques for human growth and inner exploration. Over the last four decades Aneesha has helped to transform the lives of thousands of people all over the world, through her popular workshops, trainings and individual sessions. She has trained hundreds of people all over the world to do this work, helping them transform their own lives and incorporate a deeper understanding of emotional expression into their work with people. Click here for a list of active Pulsation practitioners around the world. She continues to lead workshops and trainings throughout Europe, Russia, the Americas and now also in the Far East. Have a look at her full events calendar to find a workshop or training near you. When she's not traveling she lives in a small town in Northern California.